Lanthanide metal–organic frameworks (Ln-MOFs) have recently received increased interest due to their interesting and useful luminescence characteristics, such as large Stokes shifts, long luminescence lifetime and a wide emission range – all the way from ultraviolet to near-infrared. Furthermore, the luminescence of these materials shows strong temperature dependence, which makes them excellent candidates for the development of luminescent thermometers. Ln-MOF thermometers have recently been realised through the mixed lanthanide MOF approach, whereby two distinct lanthanide ions are incorporated into the MOF structure. There is an excellent linear correlation between the intensity ratio of the emissions from the two lanthanide ions and temperature. Such ratiometric luminescent thermometers have distinct advantages over conventional thermometers due to their fast response, high sensitivity and non-invasive operation. 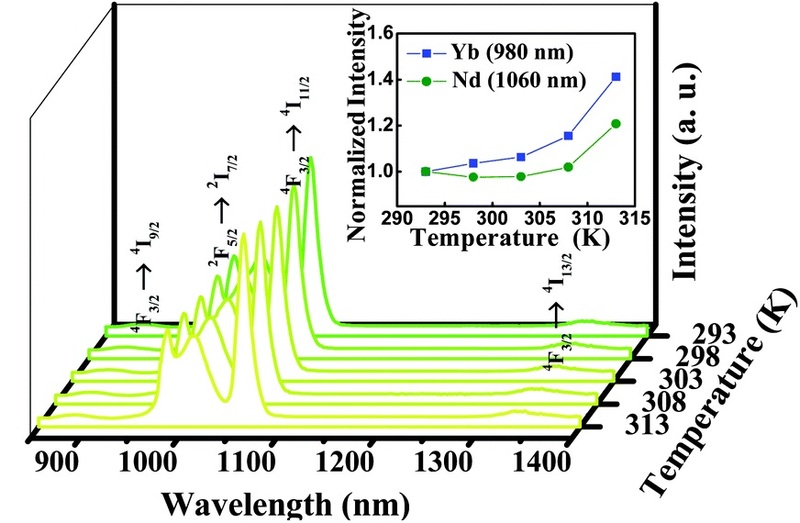 Guodong Qian and team from Zhejiang University recently designed a novel mixed Ln-MOF thermometer with excellent sensitivity over the physiological temperature range (293-313K) by incorporating Ytterbium and Neodymium into the MOF. With excitation and luminescence in the near infrared window, this thermometer is harmless to biological tissues and its resolution is high enough to measure the temperature differences in pathological cells. These characteristics make this luminescent thermometer ideal for biological sensing. Emission spectra of Nd0.577Yb0.423BDC-F4 in the range of 293–313 K excited at 808 nm; inset: temperature dependence of the normalized intensity of the corresponding transitions. To find out how more about this thermometer, read the paper in ChemComm today! Pharmaceutical cocrystals – cocrystals that contain a drug molecule – can improve the physicochemical performance of drugs, making the prescription you take on doctor’s orders more effective. The properties of any crystal are inherently dependent upon composition and crystal packing, so if you have control over these two things you have control over the physicochemical properties. Following an explosion of interest and work in this area over the last decade, Michael Zaworotko and colleagues from the Department of Chemical and Environmental Sciences at the University of Limerick review the current state of the literature on pharmaceutical cocrystals. They cover four areas: nomenclature, design using hydrogen-bonded supramolecular synthons, methods of discovery, and synthesis and development of pharmaceutical cocrystals as drug products. Usefully, they present seven recent case studies on the clinical improvements that can be observed. The three stages of early drug discovery and development: identify a molecule that is biologically active; create a material suitable for use in a drug product; formulate the material into a medicine with excipients. A review in 2004 asked the question “Do pharmaceutical co-crystals represent a new path to improved medicines?” Zaworotko and colleagues, having reviewed the last decade of literature, can answer in the affirmative. To find out why the answer to this question is “yes” read this review today! Single molecule super-resolution microscopy is the technique which takes advantage of the photoconversion of fluorescent probes and single molecule dyes to image cellular ultrastructures beyond the diffraction limit of light. The most common approach for this technique is to genetically fuse photoactivatable fluorescent proteins (PA-FPs) to the biomolecules of interest. However, PA-FPs do not emit as much light as organic dyes, which poses a problem since this technique relies heavily on the number of photons that are collected. If you can increase the amount of photons emitted, you can increase the amount collected, which leads to higher localization and ultimately a higher resolution image. Bo Huang and colleagues from the Department of Pharmaceutical Chemistry at the University of California, San Francisco set out to investigate ways to make the PA-FPs brighter. 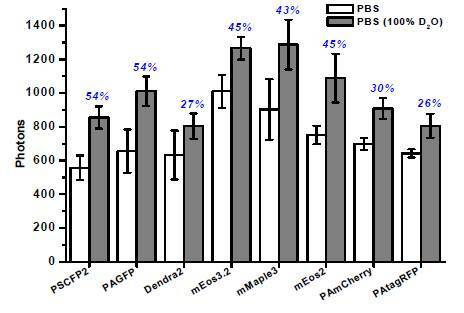 It was previously shown that heavy water (D2O) increased the photon count from popular small molecule dyes1; would the same effect be seen in the PA-FPs? The answer was yes: as the heavy water component increased, the photon count also increased. One possible concern is that heavy water in live cells can slow down cell growth and even cause cell death. However, in real life this happens on significantly longer time-scales than it does in an experimental environment, therefore, any adverse effects on live cells would be minimal. If you use PA-FPs in your work and you want to sharpen up your images then this paper is worth a read. I remember a time when mobile phones weren’t so power hungry, and when my phone could go a week on one charge. Admittedly, that was before it had a colour screen, internet connectivity and a hundred other bells and whistles. Increased device connectivity, in particular, has led to a huge increase in power demands and the need for better battery technology. Wouldn’t it be marvellous if your phone battery generated its power from a wide selection of renewable sources? 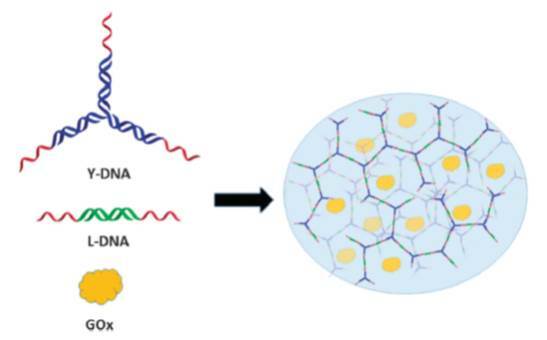 Khiem Van Nguyen and Shelly Minteer from the University of Utah look toward this possibility in their most recent ChemComm, which describes the use of DNA hydrogels in the production of an enzymatic biofuel cell. The authors describe how they used the self-assembly of DNA monomers under physiological conditions to form a DNA hydrogel capable of trapping glucose oxidase, the most widely used enzyme in enzymatic biofuel cells. This DNA hydrogel remains permeable to small molecules, such as the battery fuel, whilst successfully trapping the enzyme close to the electrode surface. Enzyme immobilization on the electrode surface is critical to achieve an effective enzymatic biofuel cell, and this model biobattery was shown to have a similar performance to previously reportedⱡ glucose oxidase biofuel cells. With enzymes capable of oxidising a wide range of fuels, from alcohols and carbohydrates to amino acids, it may not be too long until a multi-enzyme biobattery is created that can be powered by the sweat from your skin. Then you’ll be able to browse the internet wherever and whenever you want…provided you have signal, of course. Gold nanostars are gold nanoparticles with multiple branches, a shape which gives rise to their unique properties. These nanoparticles have tuneable localized surface plasmon resonances in the biologically transparent near-IR window, and excitation of these plasmons using a laser creates a local temperature increase. For this reason, gold nanostars have potential for use in non-invasive antitumoral and antibiofilm laser treatments. The problem faced by scientists, however, is how to achieve a temperature increase that is large enough to be effective, without exposing the overlying skin to a level of irradiation that exceeds the safe limits. This is what Piersandro Pallavicini from the Department of Chemistry at the University of Pavia, and an international team of colleagues, set out to investigate. They generated gold nanostars with plasmon resonances at 835 and 1530 nm, respectively. Each of these plasmons could be irradiated separately, leading to observable increases in temperature. However, when both plasmons were irradiated simultaneously, the temperature increase was equal to the sum of the temperature increases when the plasmons were irradiated separately. The implication of these findings is that Pallavicini and colleagues successfully found a way to obtain a larger local temperature increase using irradiation that remains below the safe limits. This significantly increases the potential of gold nanostars for application in the in the treatment of biofilm growth on implants in vivo. If you are producing an immunoassay there are two key parameters you need to understand and optimise: surface structure and surface chemistry. Get these two parameters right and you will optimise the sensitivity of your immunoassay. Although there have been a multitude of 3D surface generation routes reported, they are generally complicated and require a lot of additional steps. Although these 3D surfaces lead to high probe loading levels they also often lead to high levels of non-specific protein absorption, undoing any good the surface structure would have led to. Jinghua Yin and team from the State Key Laboratory of Polymer Physics and Chemistry at the Changchun Institute of Applied Chemistry have focussed on both properties to generate a much improved immunoassay. Firstly they generated a 3D surface using UV irradiation of polystyrene spheres onto a substrate; they then grafted polymer brushes to the sphere surface. The polymer brushes not only further increased the surface area (more than doubling it from the bare sphere surface) but also acted as an anti-fouling agent, reducing the amount of non-specific binding observed by up to 90%. The commonality of the functional groups on the polymer brushes mean that any antibody can be attached to the prepared surface. To find out the details of how to make these surfaces and try them out on your own immunoassays, read the paper today! Cystic Fibrosis (CF) is one of the most common inherited diseases, with 1 in 3000 Caucasians a carrier of the single gene mutation. One feature of CF is abnormally elevated sweat anions, and this feature is exploited in the gold standard diagnostic tests. However, gold standard in this case does not stand for inexpensive nor ease of use. This leads to limited availability and the requirement for large volumes of sweat; not the easiest of things to get from newborn babies who need to be screened for CF. 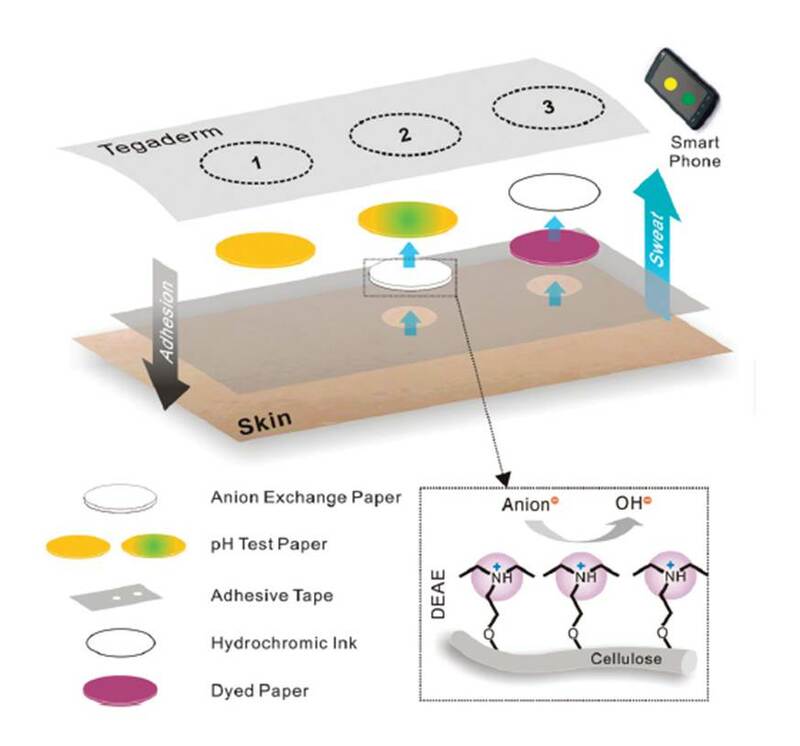 In a recent ChemComm article, Xuan Mu, Zhi Zheng and team from the Institute of Basic Medical Sciences at Peking Union Medical College have reported the development of a paper-based analytical device that can detect sweat on the skin using much smaller volumes than current tests. The team use a colorimetric detection approach with stacked functional papers (paper discs produced with a hole punch). The key element is the anion exchange layer which converts sweat anions into hydroxide ions, leading to a local alkalization and subsequent change in the colour of another pH paper layer. The authors have applied their diagnostic device to real patients and can clearly discriminate between CF and non-CF patients with a clinical reference point. With the cost of these tests being less than a dollar and being wearable, the authors have opened up a new opportunity for the screening of CF. Mechanically interlocked molecules have received ever increasing focus over the last number of years due to their potential to mimic the function of macroscopic devices in the molecular world. Examples include molecular elevators and molecular muscles and with this Communication Zheng Meng and Chuan-Feng Chen of the CAS Key Laboratory of Molecular Recognition and Function at the Chinese Academy of Sciences in Beijing have added pulley-like shuttling motion to the toolkit. Using their previously reported* triptycene-derived crown ether host and combining it with a linear guest with three dibenzylammonium and three N-methyltriazolium sites, they have made a molecular pulley system that mimics the plain rotary motion and linear translocation of full sized pulleys. The movement is powered by acid or base leading to one end of the cable-like guest moving towards the host while the other moves away (picture). The researchers have not only added to the toolbox of molecular motion components but also provided new insights towards further developing molecular machines. If you want to make your own molecular pulley read the article today! When research in a particular area reaches saturation point, the question of future applications becomes critically important. This recent Feature Article in ChemComm considers molecular logic gates, which have not yet achieved pure computational applications (with their hoped for advantages) due to limitations caused by noise build-up and cross-talk between various biomolecular elements. Thus they are unable to compete with electronic computing devices. The authors ask the question: what potential applications are there that justify the continued research in this field? Evgeny Katz from the Department of Chemistry and Biomolecular Science at Clarkson University with Sergiy Minko from the Nanostructured Materials Lab at the University of Georgia lead the reader through a short overview of potential answers. These include “smart” switchable membranes, electrodes, biofuel cells and drug-releasing systems. The use of biochemical data processing to produce a yes/no answer provides the opportunity for direct coupling with signal-responsive materials to produce a closed-loop “sense/act” operation. This ability has the potential to transform the field of biosensors and bioactuators. (A) A biocatalytic cascade activated by enzyme–substrate inputs and resulting in the in situ produced pH changes. 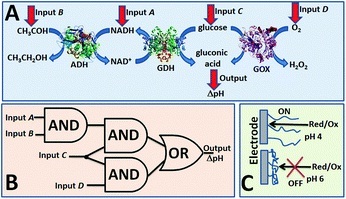 (B) The logic circuitry equivalent to the biocatalytic cascade. (C) pH-switchable electrode interface modified with a polymeric brush. The authors could be considered brave to ask the question of such a popular focus of research, but this article provides an opportunity for reflection and thought about what biochemical computing research can uniquely achieve. Having read this article I was left with a sense of excitement at the specific in vivo sensing possibilities that biochemical computing provides. To find out if you think the opportunities are exciting too, read the article today! Self-propelled micro/nanomachines were once the thing of science-fiction, but as so often is the case, fiction has become reality in recent years. Such devices could in the future find uses in environmental remediation and biomedical applications. 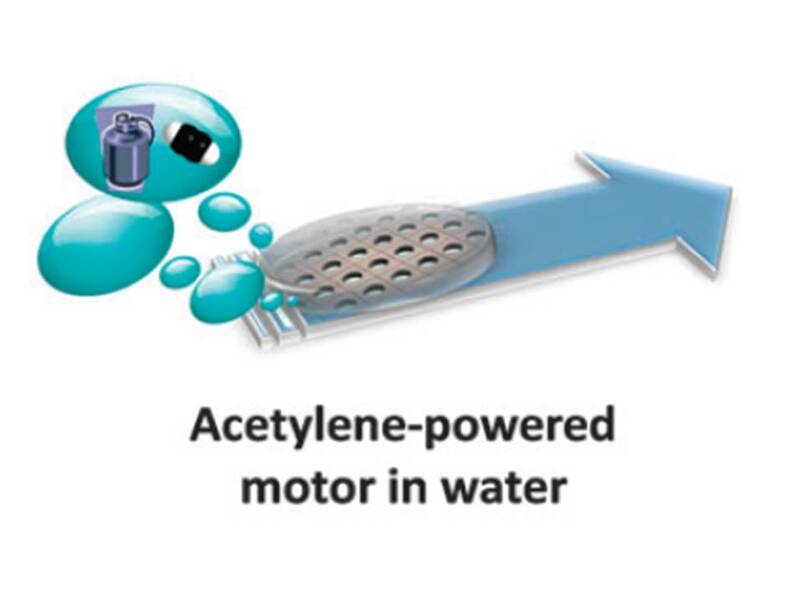 Researchers around the world have been making progress on designing these machines, and it is a novel fuel-free autonomous self-propelled motor which is the focus of this Chemical Communication by Martin Pumera and team from the School of Physical and Mathematical Sciences at Nanyang Technological University. 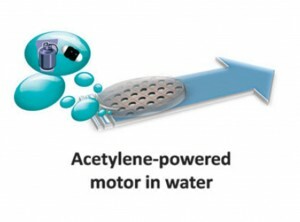 Rather than focus on oxygen bubble propulsion, which often requires the use of high levels of toxic hydrogen peroxide, they have developed an acetylene bubble based motor. To achieve this they utilised the reaction of water and calcium carbide, which produces acetylene and calcium hydroxide. This approach makes use of the water that will be found in the most common application environments, but does not require reactive metals such as magnesium and aluminium. The work expands the scope of bubble-propulsion beyond hydrogen and oxygen and gives designers of micro/nanomachines greater power unit choices in their designs. Acetylene bubble powered motor in water. The most important part of the research reported in this Communication is the optimisation of an encapsulation layer around the calcium carbide to control the reaction. However, to find out what this layer is made of and how to prepare it you will have to read the article today.